Power, logic, justice, authority, strategy, advice, clarity, truth. Disciplined and inquisitive, Lion faces challenges head on. He offers honest, impartial advice, and passes his knowledge on to others. He has strong ethics and high standards, and demands the same of others. A great master of courage and strength, Lion is a roaring archetype for fearless communication. He uses sound judgment to come to a solution, dealing with it in a fair and just manner. He requires a clear and workable plan, and doesn’t let emotions get in the way. He reminds you that thoughts are energy, and that thinking positively attracts favorable experiences into your life. Seize your personal power, and call upon clarity of mind in making decisions. With noble determination, you will harmonize your energy with what you desire to achieve. 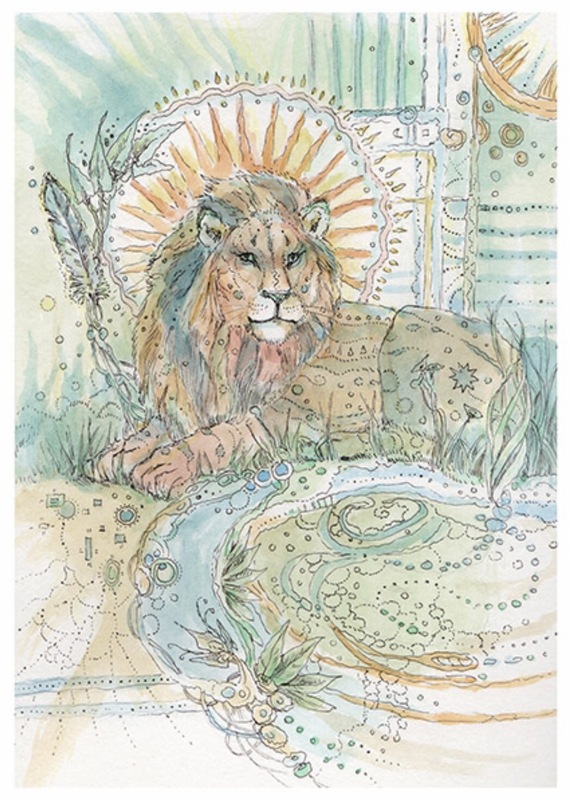 This entry was posted in Artist, Deck Review, Featured Card of the Day, General Tarot, Readings and tagged King of Feathers, Lion, Paulina Cassidy, Spiritsong, Tarot.